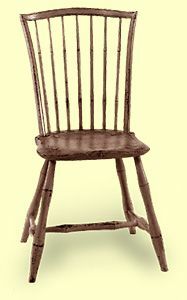 This Windsor chair style is copied from a chair from the last decade of the eighteenth century. The serpentine crest, bamboo style turnings, and less pronounced saddle shape of the seat are a clean brake from the vase and baluster turnings frequently identified with Windsor chairs. This traditional Windsor chair is made from maple, poplar and hickory. It is available in a paint or natural wood finish, and in an aged and distressed paint finish.